When visiting the Tracy Historical Museum, if you only see what is directly in front of you, you may miss something magnificent farther above eye level. 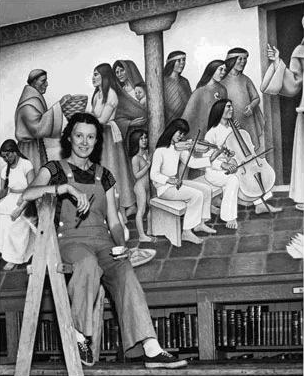 Among those “somethings” is a rare and wonderful mural by the Oakland-born artist Edith Hamlin (1902–1992), whose other works included murals at Coit Tower and Mission High School in San Francisco, and at the Department of the Interior in Washington, D.C.
Edith Hamlin at work on the Mission High School mural, circa 1936. Shortly after the United States Post Office opened at the corner of 12th and Adam streets here in 1937, Miss Hamlin painted a series of three murals depicting Tracy’s early history. Mark your calendars for the next History Seminar on Wednesday, November 18th at the Tracy Historical Museum! 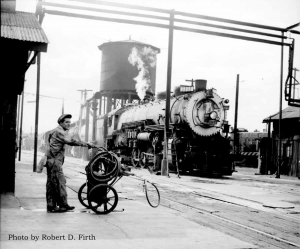 Learn about Tracy’s railroad history from someone who lived it. Join Stephen Ridolfi for a discussion about his life and times as a Tracy Trainman. Mr. Ridolfi, a lifelong Tracy resident, worked as a Southern Pacific conductor and brakeman out of the Tracy area for 40 years. 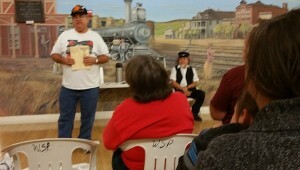 Mr. Ridolfi will describe the adventures and myth-busting life of a trainman in the San Joaquin Valley. There is no charge to attend this event at the museum. For more information, please email the Tracy Historical Museum, visit their website or phone 209-832-7278. Thank you very much for your support of the West Side Pioneer Association and Tracy Historical Museum. Event information via Larry Gamino, President of the West Side Pioneer Association/Tracy Historical Museum. Steve Ridolfi gave a lively talk on his life riding the rails with the Southern Pacific, covering everything from getting his start with the railroad — interrupted early on by a stint in Vietnam with the Air Force — to the dangerous conditions encountered (snakes, stray box cars, random derailments and trespassers), to the grind of working 16-hour shifts in conditions that ranged from ice-cold winters to sweltering summertime. Mr. Ridolfi is also a noted portrait and event photographer. His work can be viewed on his website at RidolfisPhotographics.com.